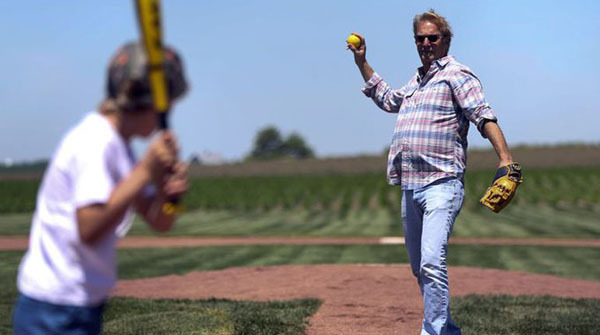 The 25th anniversary of baseball movie classic Field of Dreams was celebrated at the site of the actual field that was used for the movie set over the weekend in Dyersville, Iowa. Actor Kevin Costner showed up to mark the occasion, had a catch with his kids and played in a celebrity softball game. With him were a host of other dignitaries including actor Timothy Busfield, Broadcaster Bob Costas, American Cy Young award-winner Bret Saberhagen and thousands of fans. You can read more about the event over at the USA Today. Ray is this heaven ….no, it’s Iowa Great movie! Good catch Christopher 🙂 I personally love this movie and I’ve always wanted to check out that field for myself. Hopefully one of us will be able to go and take some photos…or maybe we’ll get a customer from that area.